Karen Loucks Rinedollar » Blog Archive » Was 9/11 a Character Developing Experience? Was 9/11 a Character Developing Experience? On the morning of 9/11, my parents were visiting me in Denver on their annual visit. They still lived at the time in my childhood home, about a mile from the Pentagon. There is no doubt that their day would have much different if they had woken up under their own roof in Arlington. As they slumbered in my king sized bed, I met with my future husband Gary, whom I’d been dating a mere two months, at our local rec center for an early morning kick box class. Covered in sweat and ready to grab a little breakfast together before going our separate ways for the day, a Secret Service friend rushed past us as she said, “I have to leave. Our country is at war. Go look at the television.” Perplexed, we stood dumbfounded with dozens of other exercisers in front of a screen belting out the morning news. 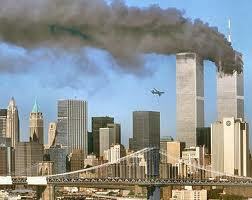 A plane had hit one of the Twin Towers. Like most who initially heard this info, we assumed it was an unskilled pilot flying a small personal craft. When reports came out that it was a large passenger plane, it was confusing. How could an experienced pilot make an error like that? Then we witnessed the second plane strike. WHAT WAS GOING ON? We continued with our plans to the local bagel spot hoping to grab some post workout nosh while watching the story unfold. Oddly, everyone in the restaurant was blissfully unaware of what was transpiring just 2000 mile east. When we heard that the first tower essentially melted, it was time to go our separate ways. Gary went to work and I returned home. My folks were sitting in bed witnessing the surreal sights. I climbed in between the two of them as if I were 30 years younger- just in time for the second building to melt to the ground like a stick of butter in a microwave. 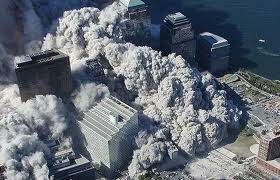 The steel, the windows, the planes, the people- all disappeared into a billowing cloud of dust. This was what you’d expected to see in a David Copperfield show, not the national news. It was amazing witnessing a world event as an adult in the presence of my parents. I observed a lot of myself in both of them. My mother, the extravert, wanted to head back to find out how the house, our neighborhood, her friends were doing. My introvert father was content to lay low and collect the facts as they were released. He had no intention of returning to the D.C. area until there were more answers. Even if he had wanted to travel, all flights were cancelled so we spent the week numbly under eerily silent skies and trying to make sense out of what was going on. As many of us wondered if there would even be a world to wake up to on September 12, we soon realized as horrific as events can be, life really does keep going and we march onward. Such timeless wisdom Henry Ford offered. Karen Loucks Rinedollar has appeared on Oprah and NBC Nightly News with Brian Williams. She is best known as the founder of the children’s charity Project Linus and as the author of Working for Peanuts: The Project Linus Story. Karen is a professional speaker sharing the importance to living a Purpose-Full Life as well as training medical professionals on the importance of Excellence in Healthcare through patient safety and customer service. You can follow her on Twitter at #KarenLoucks303. « Ask Not What Our Country Can Do For You…..